This post demonstrates techniques to find unique and duplicate values in a data set. It is one of the most common interview questions as it is commonly used in day-to-day data management activities. SAS has some easy inbuilt options to handle duplicate records. 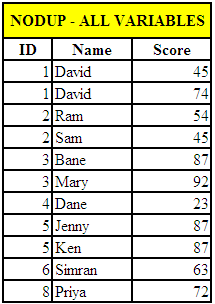 Below is a sample data set that can be used for working. In PROC SORT, there are two options by which we can remove duplicates. The NODUPKEY option removes duplicate observations where value of a variable listed in BY statement is repeated while NODUP option removes duplicate observations where values in all the variables are repeated (identical observations). The NODUPKEY has deleted 5 observations with duplicate values whereas NODUP has not deleted any observations. Why no value has been deleted when NODUP option is used? Although ID 3 has two identical records (See observation 5 and 7), NODUP option has not removed them. It is because they are not next to one another in the dataset and SAS only looks at one record back. 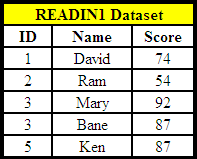 To fix this issue, sort on all the variables in the dataset READIN. To sort by all the variables without having to list them all in the program, you can use the keyword ‘_ALL_’ in the BY statement (see below). Data set must be in sort order. 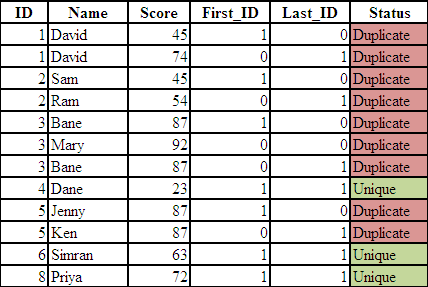 Use PROC SORT to sort the data set by ID. -The observations where both First_ID and Last_ID do not equal to 1 go to the newly created data set DUPLICATES. -The ELSE statement outputs all other observations (i.e., where First_ID and Last_ID equal to 1) to data set UNIQUE. 13 Responses to "SAS : Identifying and storing unique and duplicate values"
If i want to remove reverse duplicates how should I go about it? I have mentioned the data below..For the below data: lets say we have one row which shows Bangalore to Pune and the other record shows Pune to Bangalore. I just want to keep any one of those values.. If distance is same from same source or destination to any other source or destinations..
Could someone please help me in this? :How should I do if I want to remove reverse duplicates for the below data: let´s say we have one row which shows interaction between rs1, rs2,through mode1 and mode2 and the other record shows the same interaction but changing the order of the SNPs and consequently of the mode of inheritance? I just want to keep one of those rows.